Relationships shape our lives, beginning at birth. Babies connect with their family, gazing at their faces, crying and cooing. What parent can resist a newborn who stares in their eyes? Your baby is learning who you are—a very important caregiver in her life. 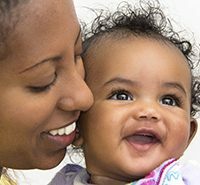 Babies also show connections with family when they play “my turn, your turn” games such as “peek-a-boo, I see you” or, during meal times, “I drop the spoon, you pick up the spoon.” These early back-and-forth interactions help your baby trust that you are available and care for her. Building this trust happens when you consistently respond to your baby’s wants (play), needs (affection, food, and diaper changes), and schedule (sleep time). Some babies respond more than others. It may be difficult to engage babies who are colicky in back-and-forth play when they don’t feel well. Babies born with developmental delays or who have vision or hearing problems also may be slower to respond. 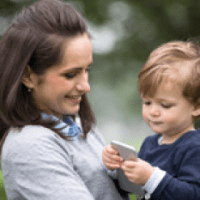 Parents may have to “work” more at playing—catching their baby’s gaze or responding positively to each of the baby’s efforts to connect. Showing affection and caring for your baby is very important even when your baby responds differently. You are providing the early building blocks in his social and emotional life. Warm, responsive, and trusting relationships develop from many positive interactions over time. Our daily routines often set the stage for children to feel safe and secure in their home or other familiar environments. We use routines to meet many daily demands. For example, most families have a routine for morning and nighttime. These routines are predictable and repeat every day. Your child can predict and depend on you to help them get up, get dressed, eat breakfast, and start their day. Likewise, at night children will fall asleep quickly if they have a bedtime filled with affection and predictable routines. Before turning off the light, do you rock your baby, sing a lullaby, or read a story? Doing this every night tells your baby or toddler that you care for them and that you are available. Children who experience responsive and trusting relationships often learn that they can soothe themselves until their parent comes. Over time they learn to manage their feelings and cope with occasional changes in schedule. By responding consistently to your baby and engaging your baby in playful interactions, you are creating a relationship to last a lifetime. Within any new relationship, there is a balance between sharing too much information and not sharing enough. For any relationship to work, there must be a sense of trust. Likewise, this is true when your family enters the early intervention system. As a parent, it is important to share your concerns and dreams for your child, along with other information, with your service coordinator, other CFC staff, and EI providers. It is not unusual to feel uncomfortable about sharing details. Yet, its very important to keep sharing information. They need your point of view to understand your hopes and concerns and to be responsive to your child and family needs. Please remember that your service coordinator will continue to contact you regularly to check in on services, your satisfaction with services, and any other changes that might impact your family. You may wonder what is appropriate to share with providers. Here are some conversation starters that you can have with providers. These can be helpful throughout your time in the early intervention system and upon transition into another program. These are things I want everyone to know about my child. These are my concerns now. This is how my child communicates with me and others. These are ways my child likes to learn new things. This is what my child does when she needs help. Places my child likes to go. These are things I would like my child to learn in the next 6–12 months. These are things I would like to learn in the next 6–12 months. This is how I learn best. Here is what a typical day looks like for us. 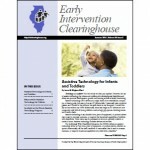 Adapted from the Illinois Early Intervention Guide for Families at eiclearinghouse.org. It is included in the information packet you received from your service coordinator upon entry into the EI system.